When going out to the battlefield, besides your technical prowess, one thing you want to ensure is that you are equipped with the right set of gear. So, today we venture into the mixed martial arts (MMA) not to join in the fight but to check out in an intricate gear used in doing battle ” the gloves “. Well, a good UFC glove ought to be one that has got the right padding and offers tremendous protection to the fingers and wrist without hindering the fighter’s ability to grapple and deliver blows upon his/her opponent. And in this review, we do hope you will find one or two UFC gloves fitting for your use. After spending days researching and testing. Our experts suggest the best UFC gloves for padding, sparring and guaranteed protection. This review begins with a glove that has been perfectly designed with the right technologies which make it a combatant’s delight. It is made from 100% full-grain leather and is built with the patented Dual-X technology and the fusion splinting technology enable incredible wrist support thus allowing you to gain maximum power generation as you “dish out” the strike. This Hayabusa gloves easily register as one of the best ion the market; this is why it keeps generating wonderful remarks among folks who enjoy using a pair in the ring. However, there have been complaints over it being a little light. but that could just be an exception anyway; the glove is available in four different sizes – small, medium, large and x-large and finding the right fit shouldn’t be a herculean task. This glove is one that we will always speak glowing about; and this is because of the features on it. Its Deltra-EG inner core which is enhanced with advance zone complex is in place to protect your hands from impact. The glove’s Y-Volar design also makes it appreciably light hence enhancing responsiveness and stability. This very piece is certainly one of the best from the stable of Hayabusa. It has been well-made with tremendous ergonomic design that helps to maintain the hands in good stead for battle. And lest we forget; it is also integrated with Hayabusa AG fabric which features X-static XT2 technology that imposes anti-microbial and anti-odor properties on the glove, and it weighs 4 ounces. Hayabusa known for high quality boxing gloves and gear, that product is not an exception. Another UFC glove we will like to check out is this one made in Thailand by Fairtex. The glove is majorly made with full grain leather while its lining is of nylon – which is water-repellent. It features an open palm and open thumb loop design that makes it possible to grapple seamlessly. It also has a distinctive 3-layer foam core system to absorb shock and offer good protection to the hand and knuckle. Though the glove has been gaining some traction; there have been a couple of complaints about it. Firstly, a few persons have shown their displeasure over the wrist strap being a bit large thus making the glove not to fit snugly. 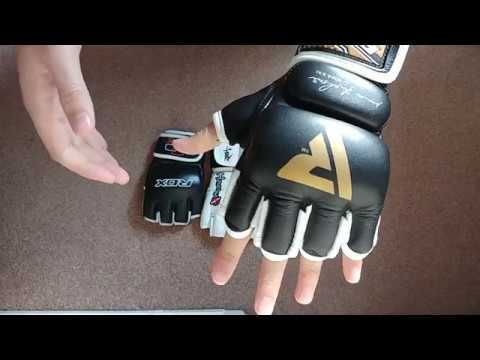 In another instance, the glove has been found to be too light with the padding not sufficient enough, and the eternal problem of Fairtex gloves not being true to standard sizing has been a concern. Dwelling more on its features; the glove has a wrist strap with Velcro closure and has its fingers split at the base to ensure that the fighter’s hand is well ventilated and that dexterity is not hindered. Plus, the fingers are relatively longer thus offering the knuckle enhanced protection. This piece from Fairtex is available in sizes ranging from regular to X-large, and weighs 7.2 ounces. The Fairtex Ultimate UFC glove is just about another functional piece that can serve some purpose in the MMA ring. It however needs to be said that it is far from being a perfect one; there’s a need for an upgrade on it. Some may argue that it’s okay for its price but we do hold the old saying that “what’s worth doing, is worth doing well” dear so, nothing more than the very best should pass the production line. Well, it should get 7 out of 10 from us. Made from polyurethane leather, this pair of UFC gloves is a product that is not only functional but really durable. The glove was designed to deliver considerable ergonomic support even as its natural curve should ensure a good fit for the hand. Furthermore, the high density stitching and detailedness employed in making this piece should further enhance its durability and usability. For all the effort put into designing this product, and for the many positive reviews it is getting; there seems to be a couple of glitches that cannot be waved aside. 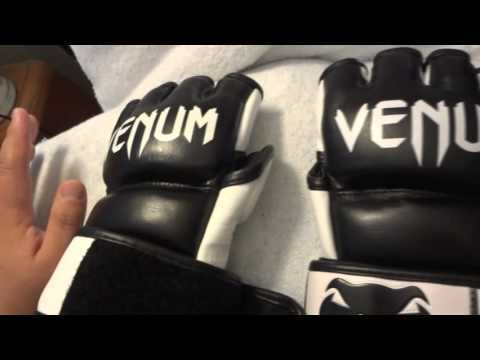 These issues center around how uncomfortable the Venum Undisputed 2.0 glove tends to be upon being worn and used. In some cases, it is either about the rigidity of the wrist support or the tightness of the finger hole. Nevertheless, the multi-layered foam construction which offers great protection to the knuckle appears to be one of the highpoints of this piece. And as you must have seen, it has also got a wrist support plus adjustable strap for the purpose of keeping the glove securely fitted to the hand. Again, it has an exclusive Velcro strap style system for single hand pre-positioning. It is available in 3 distinct sizes – small, medium and large/x-large. This gear has got some quality to its name – Venum is known for such anyway – but maybe not enough though. While one cannot deny it of the many positives [as you may read from reviews], it is yet impossible to look the complaints that have emanated from using it. An MMA glove being uncomfortable for its wearer could make a mess of his/her time in the ring – be it in training or in competition – hence it is expedient that the manufacturer addresses the issue appropriately. Here is another gear built for performance and will also assure good protection and comfort. The glove is made from 100% cowhide leather and has been double-stitched for improved durability. It is integrated with advanced Gel Efficax lining which is a triple layered padding. This padding functionality is further boosted by the presence of the shell shock gel equilibrium sheet and the Supremo-shock foam that influences shock resistance. This particular one has got huge quality hovering around it but there have been a series of issues that have been tied to it. The major problem has to do with the stitching used rubbing against the knuckle thus causing the skin to hurt. Again, there have been complaints from some quarters about the glove not providing enough support and how the size does not always run true to standard sizing. It has been equipped with the Quick-EZ hook-and-loop closure in order to help the wearer actualize a snug fit and also get some wrist support. Plus, its Nalba-palm design makes it a very functional piece as this (design) guarantees you ultimate grip while allowing maximum ventilation. It has a weight of 6 ounces and comes in four varying sizes which include small, medium, large and X-large. 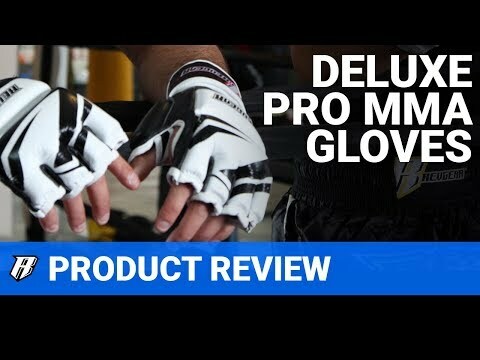 RDX is known for creating top quality MMA and UFC gloves and this very piece [under review] is only a testament to the company’s commitment to developing products that work. This glove has the signature of a gear that is meant for top performance and it is no doubt enjoying a huge following at the moment. It is however important that the manufacturer work upon its design to ease the discomfort caused when using it – the material is great nonetheless. Next up is a tough glove that is good enough for hitting heavy punching bag as well as being used for sparring. It is made from 100% softech leather which not only gives good protection but also ensures that the movement of the hand is not impeded in any way. Hand fatigue is minimized when using this piece as its padding [on top of the hand] is split by stitching. People have however had to show their dissatisfaction with regards to using this piece. There have been complaints over the lack of good support for wrist and sufficient (protective) cover for the knuckles. Plus, the ‘eternal issue of gloves running too small is yet one of the few complaints that have evolved. And in some other instances, it has been viewed as being relatively costly. But for all the issues that might have been raised, there are good reasons why an ample of MMA fighters for the product from Revgear. Aside being made from genuine leather; it is integrated with the double lightweight RAM-Force technology padding that covers the knuckles and the thumb – the thumb protection is a major highpoint for this glove. In addition, it also has extra wrist wrapping that enables you to grapple without causing any scratch to yourself or your opponent. This is definitely not a bad choice of glove to try out in the ring. It is well-made and has features that help to deliver great result. What is more interesting is that asides the thumb protection padding, its size makes it possible to use a hand wrap underneath hence making the hand to be better protected. Its weight varies between 5-7 ounces depending on the size which can range from X-small to X-large. Here is another highly functional and stylish piece made from full grain leather material with multi-layered EVA foam padding which guarantees utmost protection for the hands and it is also equipped with a unique moisture-wicking lining. Its exterior features an interesting glossy hexagonal pattern that makes it appealing in some way and its design shows that it has been well crafted for top performance. Despite the qualities/features however, this Revgear glove is not without some blemish. Some persons have complained about how the inner lining gets to rub against the skin. Another minor glitch you may likely observe when using this MMA gear is that it takes time to break in, and on certain occasions, the stitching has been found to be a bit shoddy. This glove features a mesh panel with eleven (11) air holes that help to promote breathability and provide your hand with some ventilation while the piece is being worn. It can be laced up but it also has a strong (full length hook-and-loop) Velcro closure for a secure fit. And the compressed Hex-Tech grid padding incorporated into it will help you gain greater energy dispersion upon impact. This is one of the best UFC gloves you come across in the market. The issue of the inner lining rubbing against the knuckles can be easily resolved with a hand wrap, and the other issues can be regarded as exceptions. Its unique padding system and stylish design are features that make this piece fascinating – one to be highly recommended. Plus, it is even worth noting that the pair comes at a reasonable price. By the way, the glove is available in sizes and weighs between 5-8 ounces. This is a piece that you [as an MMA fighter] will find really useful whether in competition, training or sparring. It was designed in such a way that makes it easy for you to transition between grappling or striking. It is made using Sanabul engineered leather and handcrafted foam which delivers huge comfort and yet impact a commensurate degree of durability. Sanabul no doubt has made a product that ranks among the most efficient in its class, and that it goes for a cut-down price gives it some edge over the others. The reason why this has been a choice pick for mixed martial artists is simply down to the quality reflected on it. That quality is seen in the material used in making it as well as the craftsmanship that brought it to birth. Putting its features into perspective; the Velcro closure system [coupled with the technologically advanced fit] will help make certain that the glove is securely fitted to the hand while in use. Plus, its premium anti-microbial and moisture wicking lining will effectively hinder the growth of bacteria and fungi; and also prevent moisture from building up within the glove. Its weight can fall within the range of 5-8 ounces depending on the size. This UFC glove from Sanabul is quite simple in design but highly efficient nonetheless. It has got the basic elements every UFC combatant will desire in a (fighting) glove. A top quality piece that won’t cause you to break your bank, and one that we can recommend without nursing any doubt over its functionality. This glove is specifically built for training, sparring and amateur MMA competitions. It is equipped with a 4-layer foam system to give assured protection and guarantee shock resistance upon impact. It is made from premium quality synthetic leather and has an open palm design that makes gripping seamless. A couple of those who have previously used this very item have griped over its looseness especially when worn without hand wraps. In other instances, the glove has also attracted criticisms from certain persons who felt that the rough inner lining and insufficient padding around the knuckles are making the glove to be somewhat uncomfortable to use. Besides its wonderful leather construction which impacts appreciable durability, the Combat Sports MMA Glove features a thumb pad in addition to the other padding integrated therein; all these are in place to ensure maximum safety. It also bears white knuckles denoting the legal striking zone. The glove is presently available in 2 different sizes: regular size [with a weight of 6 oz.] and the large size weighing 7 oz. The Combat Sports UFC Glove is certainly not designed for hard punching or hitting very heavy bags – this has been clearly spelt out by the manufacturer – hence it may not be a professional’s top pick. Notwithstanding, it does an exceptional job in the little way it can and the price is quite reasonable; it definitely worth every penny spent on it. Made from top grade synthetic leather; this item features many relevant properties/elements which make it very functional and reliable. Its refined padding imposes an ergonomic fist shape that makes it very flexible and comfortable. The glove also reflects anti-microbial capability by absorbing moisture and sweat through its EverDri technology. While this glove does score high in terms of quality and materials used in making it, there are an ample of glitches that have caused some users to show their discontent. One of such is the lack of sufficient cover for the knuckles and neither does it have any thumb protection. Again, the glove does not look like one made for heavy punching, and size options are limited to just 2 variations – small/medium and large/X-large. The glove’s full length wrist wrap strap allows you to custom fit it [to your satisfaction] and also deliver a credible support for wrist. Additionally, it features flexible finger ridges; this aids in easing the movement of the hand when in the act – fighting in the ring or sparring at the gym. It has a weight of 5 oz. and comes at a very affordable price. Everlast isn’t a brand that will produce an item without putting the specifics into consideration. 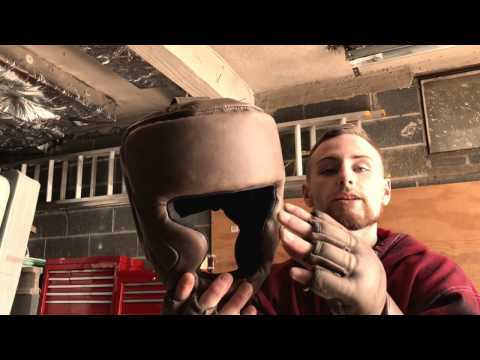 This very MMA glove has been made with beginners/amateurs in mind so the criticism about it not being effective when it comes to hard punching might be a bit harsh. That said, inbuilt features such as the refined padding and the EverDri treatment are just some of the reasons why we have come to love this pair. Lastly on the list we have a simple but highly effective piece from Anthem Athletics. It was made from 100% full-grain cowhide leather – this means durability is guaranteed. The glove’s multi-panel construction and intricate finger design will help provide you with optimal support that makes unhindered mobility a certainty. Here is another popular choice among UFC fighters and this goes to show the quality it’s imbued with. However, some users have griped over the loose fit of the glove while some do not find it to be comfortable enough. Again, this seems to fall short in the aspect of providing adequate protective cover for the knuckles. The piece under the verbal that is under review and here is one of the cheapest [and most affordable] fighting glove in the market at the moment; and it’s great to know that quality has not been sacrificed for low cost as some as it possesses features that help to advanced its effectiveness. You won’t have any regrets buying this pair of UFC gloves. While the focus may on getting a UFC glove – which are meant to have a minimum weight of 4oz – it is vital to be mindful of the fact that you have to get in shape for the competition proper. This informs the need for having at least two pairs of gloves; one for sparring or training and the other set apart for the competition. A 4oz may be fine for an ultimate fighting championship bout but something heavier is required for training so, it is advisable that you get a pair weighing between 14 – 16 oz. The kind of materials used in making the glove is another critical factor that cannot be overlooked. While the ones made from synthetic leather aren’t a bad choice, those made from 100% cowhide leather should be more preferable as they are safer to use. Over and above all, you should root for leather gloves that are non-irritable, and will give you a soft feel. Again, you have to make sure that the lining has moisture-wicking capability. The features that a pair of UFC gloves bears can greatly influence its durability and comfortability. However, as an MMA fighter, you should be more concern about the latter; as such, you should endeavor to have a glove with adequate padding around the knuckle area. Other features that you shouldn’t lose sight of are the wrist support and Velcro closure. Also, you will have to consider a pair of gloves with an ergonomic design that will promote free flowing movement of the hand or playing fast punching with a speed bag platform . Size will always matter when buying MMA or kickboxing gloves ; you cannot so much fall in love with a particular glove that you fail to check if its size is appropriate for you. So, you should follow the sizing guide made available online if you’re making an order from an online store. And do not lose cognizance of the fact that some gloves are purposefully designed to be used along with hand wraps. The best UFC gloves are not necessarily the most expensive; there are many good ones that come at an affordable. Hence, you do not have to even spend a large sum of your monthly earning to get a top grade UFC love pair if you are not a pro UFC fighter. The 2P’s of a good MMA glove are ‘performance’ and ‘protection’, and these cannot be traded for anything else by any serious minded mixed martial artist. We believe that discussed in this review are some of the very best in terms of performance and offering good protection to the hand, wrist and finger when engaged in combative act. We’re spoilt for choice here but we trust you will find one or two [of the items brought under review] fitting for your use.